John Michael McDonagh’s last film, ‘Calvary’ was one of my favourite films of 2014, an often bleak tale of a priest coming to terms with an uncomfortable discussion in the confession booth. It retained the black comedy that was central to his debut feature ‘The Guard’ and the work of his brother, but with a more potent commentary and a stronger emphasis on plot and mystery. ‘War on Everyone’ is more like ‘The Guard’, with a lighter subject matter and the focus more on the buddy cop elements and the humorous dialogue than the plot itself, and whilst it’s arguably the weakest film released by either McDonagh, I still really enjoyed it and laughed countless times. The plot focuses on two corrupt cops who spend most of their days taking advantage of minor criminals to develop a fund for their retirement. Those cops are the Glen Campbell loving alcoholic Terry Monroe (Alexander Skarsgard), and his partner Bob Bolano (Michael Pena), with both actors delivering great comedic performances. The plot is very much window dressing to allow for the focus on character and comedy, but it largely concerns the cops getting in over their head when they try to take advantage of a man more powerful than they’re used to, a British Lord (Theo James). James is probably most known to audiences in the US for the ‘Divergent’ series and I was surprised at how convincing he was, although he’s overshadowed by a delightfully creepy turn from Caleb Landry Jones as one of his associates. 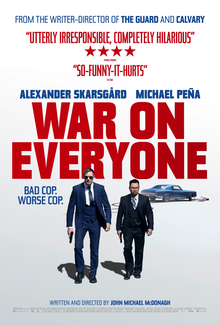 ‘War on Everyone’ enters a crowded genre of buddy cop classics, but there’s enough of a different slant to keep this feeling fresh and exciting, albeit the amount of actual policing getting done begs the question as to how these guys became cops in the first place! One of the most impressive attributes of the film is how quickly it gets into its groove and establishes its setting and its characters, and despite their abhorrent behaviour at times, I found Pena and Skarsgard managed to make their characters likeable in spite of themselves. It’s often very dark (perhaps a representation of the McDonagh’s bleak worldview), but there’s always a biting undertone of humour to deliver a lot of cleverly written barbs from actors who relish saying them. It’s not all plain sailing – some of the quips feel a little overwritten in a smarter on the page than on the screen kind of way, but the dialogue is rapidly paced and very funny for the most part so it’s easy to overlook. I also liked how it’s never explicitly stated whether the film is set in the present or in the past (we can presume the present but I like the ambiguity). ‘War on Everyone’ may not be quite as smart or as entertaining as McDonagh’s previous films, but it’s a fast paced and funny movie with great performances across the board and he continues to be one of the most exciting filmmakers around.